Islamorada is in the Florida Keys. Great place for families whether or not staying at the hotel or just visiting for the day, popular with spring break students,parking pool, private beach, swimming, lounge chairs provided for a small fee, tiki bar, snack bar with picnic tables with waterfront view, live entertainment, jet ski & kayak rentals, snorkeling, great for night life. 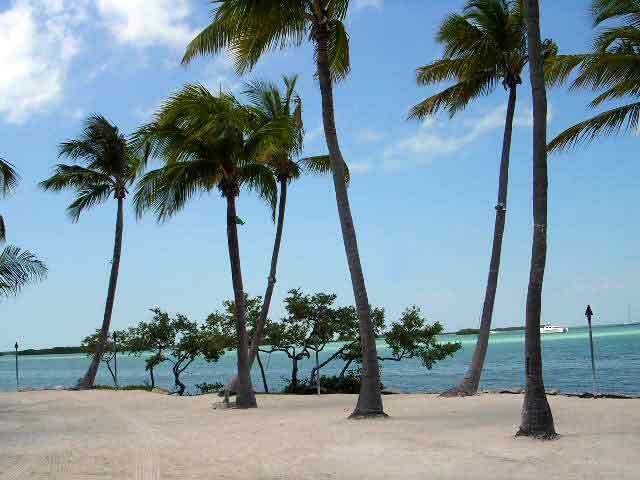 Islamorada's fishing landmark and famous marina featured on many fishing shows. boat rentals, chartered fishing trips, pontoon boats, tackle shops with coffee and deli. Miss Islamorada docks there which is a party boats $60 for full day of fishing includes rods, tackle, and bait. Bring your own lunch and drinks. Nice local dive bar! The backyard patio has plenty of fun bar games, including ring toss, a swimming pool, pool, darts, and plenty of lounge chairs. Accessible by boat! Tourists may want to spend their time out back as the inside is populated by seedy locals most of the time. 63 rooms and suites on the water, tennis court, pool, snorkeling, kayaking, bar, lagoon, fishing charters, sailing, windsurfing, great for a family vacation, manatees have been frequently seen, beach volleyball, swim with the dolphins, AARP members receive discounted rates. Oceanfront resort with 203 rooms and 48 suites with full kitchens on 27 lush acres featuring tropical gardens, a palm-lined beach, a nine-hole pitch & putt golf course, tennis courts, lagoon, and pools. Recently (as of 2015) renovated because of fire. Very nice! A bayside restaurant (also known as the Islamorada Bakery) that is popular with locals and tourists. Friendly service, great food and a name you won't forget. Also, remember to check out their merchandise. You can even get a key lime cake shipped to your home. The only pizza around! tons of toppings to choose from, sandwiches, meatball subs, salads, great if you are in the mood for something other than sea food, indoor and outdoor seating, friendly service, casual dress, delivery & take out also available . Great for casual dining during the day, on the water, over looks ocean, great view for passing boats, bring in your own catch for them to cook, lobsters, stone crabs, snapper, grouper comes right from their own dock,indoor seating also available. Local dive bar/club caters to tourists and locals alike. Clientele is generally slightly more wild than the Oceanview crowd. Frequented by tourists from Miami. The back deck overlooking their private marina is a nice place to go for a drink. Huge sports store, endless fishing supplies, womens/mens/children clothing, great souvenirs, shoes,sun tan lotion, indoor fish tank, great customer service, even if you aren't a shopper it is great for browsing. Reservations suggested or very long wait, terrace and indoor seating overlooking water, island casual dress, large portions, bar, very fresh local food,you can bring in your catch of the day to be prepared. Public beach, great to relax, water is shallow so great to walk around in, public restrooms, parking, you have to bring your own chairs, snorkel gear, kayak. great to visit or lay around all day and tan! Very 'islandy' feeeling, pull up boat access, live entertainment, well stocked bar, great fresh food, island casual, indoor and outdoor seating, on the water, bugs might be bad; bring bug spray! A variety of independent tents set up selling paintings, clothing, and jewelery. Along Route 1 there are many places to stop for ceramic lizards, copper suns, palm tree plants, pots, souvenirs. 114 spacious rooms available, private spacious beach, some suites offer full kitchen, own entrance to your room, water sport rentals available on site, fishing charters. Great place for breakfast, must try their huge sticky buns! large portions, island casual dress, friendly staff, well stocked bar. Also attached to a fly fishing shop. Newly remodeled- best sushi in the Florida Keys, indoor and outdoor seating, take-out also available,well stocked bar, island casual dress, great atmosphere. You can enjoy water front views right from your window, pool and ocean swimming, great for spring break students, possibly best night life on the island. Swim with dolphins, rays, and sea lions. swimming takes place in the lagoon daily, adventure & snorkel cruises, live shows. Built to commemorate those who died in the 1935 Labor Day Hurricane. Listed on the National Register of Historic Places. Great for grabbing a cocktail after a long day at the beach, on the water, great for no shower happy hour. An oceanfront location. The resort has 65 rooms.